After retiring from the communications industry, an opportunity to host an apiary during the winter of 2003 came our way. After that, you might say we were stung. A growing interest in keeping bees led to many hours of reading, studying, and trial and error until we arrived at full fledge beekeeping. We have been in business as Peet Apiaries since the winter of 2003, and continue to look for ways to expand. 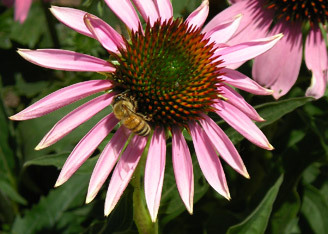 At present, we offer varietal honey and pollination services. For the last two years we’ve been raising our own queens and having them evaluated by a few local beekeepers. In the near future we will be offering them for sale. We are members of CalaverasGROWN, the Delta Bee Club, and the Calaveras Farm Bureau. Living at the foot of the Sierras in Calaveras County enables us to place our hives from the San Joaquin Valley floor to the upper elevations of the Sierra Foothills. Not only does this lengthen the availability of flora for the bees but enables us to provide a wider range of varietal honey throughout the changing seasons. Through this site we offer a sampling of information available on the importance of bees, honey and health, and how you can be a participant in the survival of the honeybee and other pollinators.